I will start off by apologizing for my absence the past two weeks. We had an incredibly busy few weeks. Murphy’s law has been the status quo lately. We have had everything from a severe pipe leak to foot injuries! My hiatus has ended and I have completed a few of the projects that I mentioned in my previous post, Upcoming Projects. 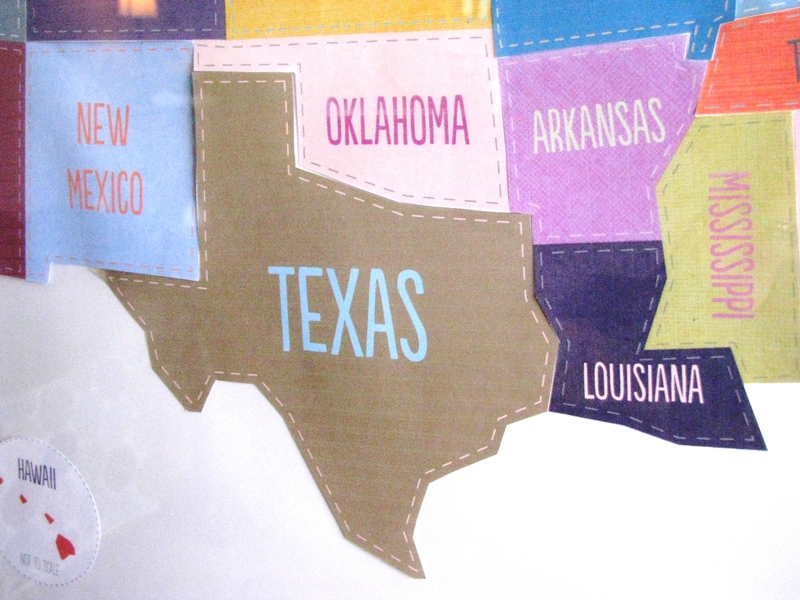 I fell in love with a Mr. Printables map of the US that I saw via Shannon Berrey’s blog post. 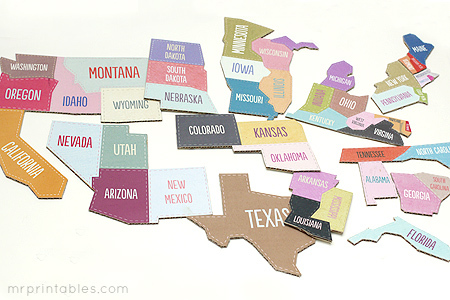 There are several format options on Mr. Printable’s site for this particular map (Color, B&W, Grey, etc). Next, I printed the map in color. As you may be able to see in the photo of the map above, the background of the map is a pale peach/tan color. My plotter printed this as a pin/salmon. 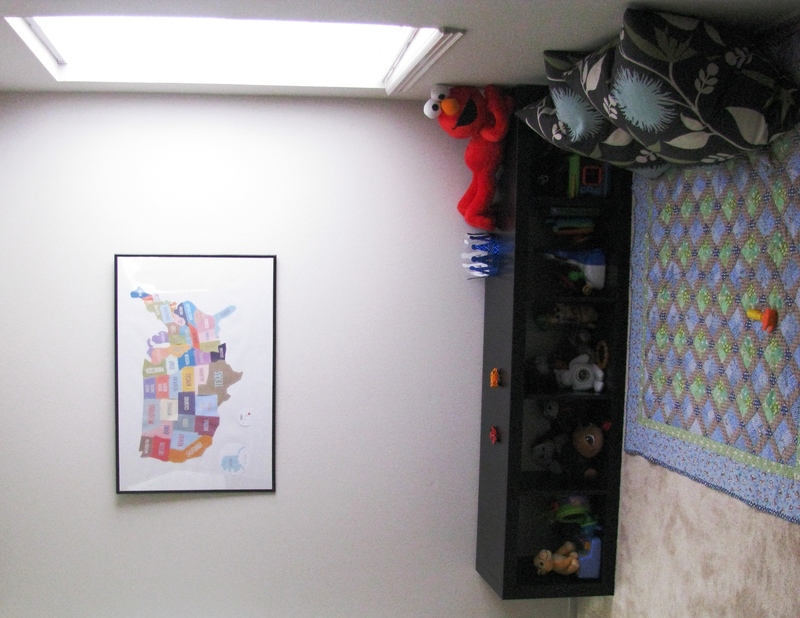 I would have been fine with that print had I been hanging the map in a playroom or schoolroom setting. However, I did not think that it would jive with the green/blue/brown color scheme in that room. 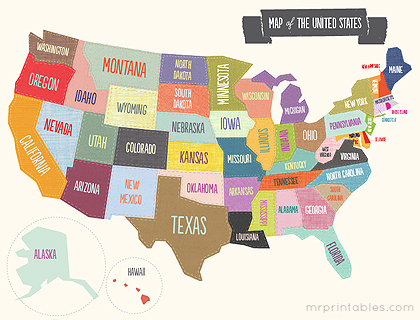 So the issue became, How can I get the color version of the map without the peach background? Some of you may be saying, “Take it out with photoshop or illustrator.” Not an option because all Mr. Printables PDFs are locked to all editing. In the end, I decided to print the jisaw puzzle version of the color map and scale it to fit a tabloid size page (11″ x 17″). 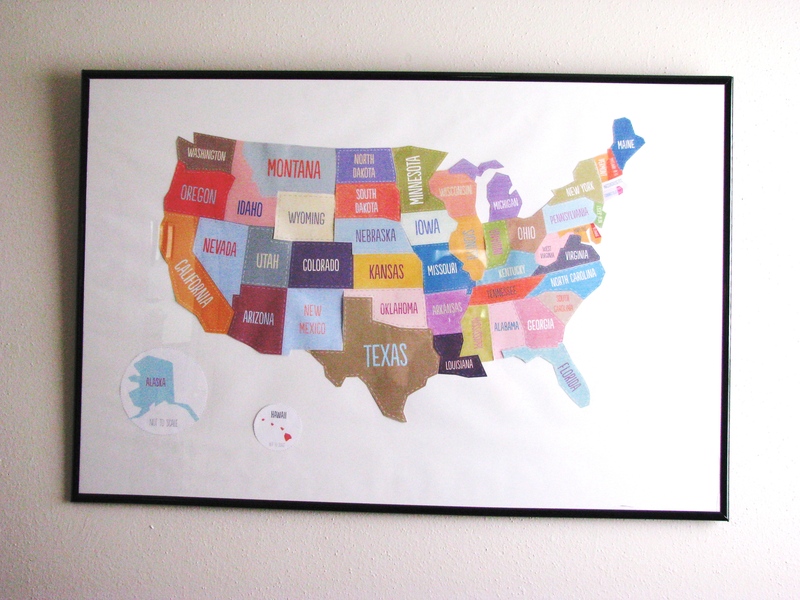 By printing the map this way I was able to get the adorable colored states sans peach background AND it still would be the right size for the 36″ x 24″ frame that I was wanting to use. 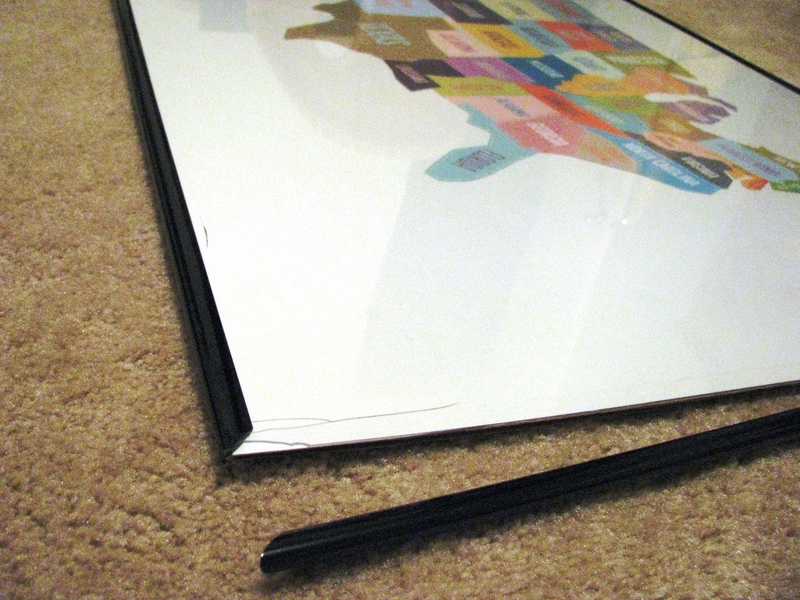 Long story short, I cut out the states and ran to my local Target for a poster frame setting me back just $9.99. 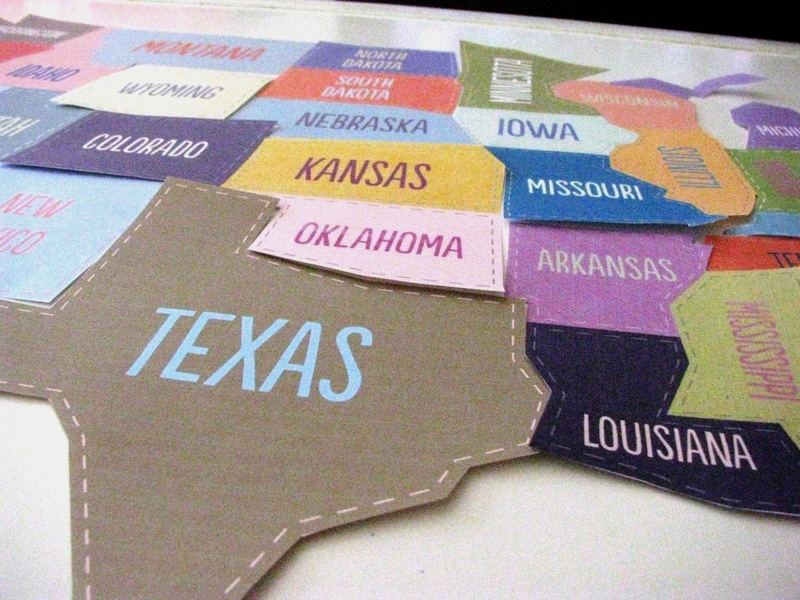 Then took apart the frame, glued on the states, and put it all back together. *Note: make sure that you do not crack the corner of your plexiglass while on the way home like I did! Last, I used a handy-dandy Command hook to hang the map on Christopher’s wall. I like that even behind the plexi glass, you can still see that the map is not all one piece. Call me crazy but I think that it adds character! I am loving the new artwork in Christopher’s room and I can’t wait to start pointing out and teaching him the states in our great nation. Do you have any artwork in your child’s room?